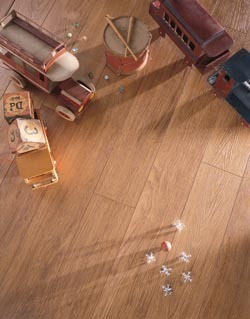 Get family-friendly flooring that holds up well far into the future with the help of our knowledgeable floor experts. As a reputable flooring store, we boast one of the most impressive inventories in the area. With so many attractive and affordable options to choose from, selecting the ideal option may prove to be a challenge. Our flooring specialists work closely with you—from selection to installation—in order to make the shopping experience short, easy, and enjoyable. By taking the time to understand your expectations in performance, appearance, and price, we are able to make product recommendations that are sure to satisfy. For homeowners interested in the perfect balance between beauty and durability, we often suggest laminate flooring. Designed to mimic the look and feel of your favorite floor materials, our laminate products are perfect for any room in the house. By utilizing the buying power of the Flooring America name, we save on the latest laminate flooring collections from well-known manufacturers. These savings are passed directly to our clients through our everyday low prices. You may even save so much on the floors of your dreams that you are actually able to replace more flooring than originally planned! Our work isn’t done when you make a purchase. The in-house technicians we employ are prepared to perform installation services on your behalf. Investing in laminate floor installation from our store, along with your laminate purchase, is more cost-effective than hiring another team or attempting to perform the install yourself. Every installation we complete is backed by a guarantee that proves our commitment to your satisfaction. Should you be dissatisfied with your new flooring for any reason, we’ll replace it with a comparable solution for free. Contact us today to view our laminate collection, or call us to book an appointment for a free consultation and in-home measurement. We proudly serve the communities of Syracuse, Fayetteville, Manlius, Skaneateles, and Cicero, NY.